The dedication of Grand Central Terminal’s main entry vestibule as the Jacqueline Kennedy Onassis Foyer is, in a sense, the crowning culmination of her tireless campaign to save this iconic landmark. The lawsuit launched by Mrs. Onassis and other influential New Yorkers in the 1970s, led to the U.S. Supreme Court ruling to preserve such buildings. Following the historic step, many other landmark buildings have been saved from demolition in New York City. The foyer now features a new plaque and two display vitrines with digital images honoring Mrs. Onassis’ life and accomplishments. 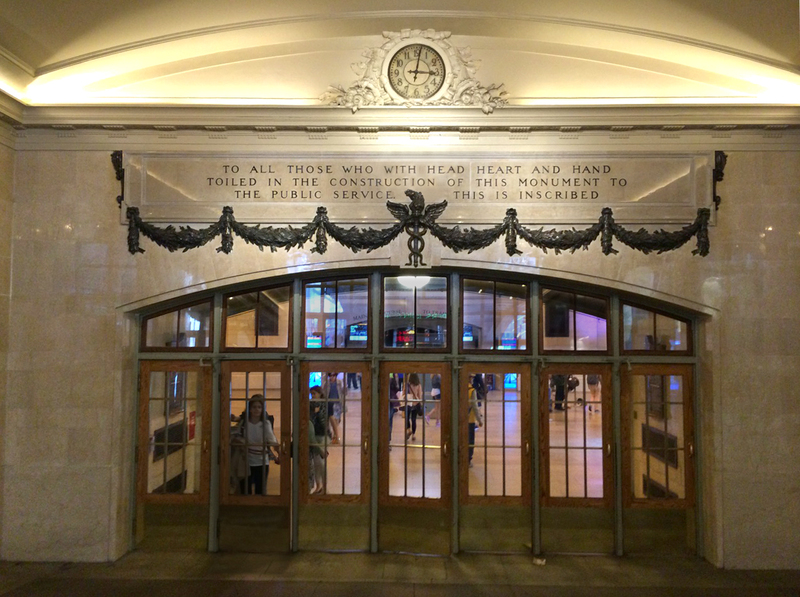 The vestibule’s marble walls and terrazzo flooring, including the bronze inscription and scroll emblazoned above the door leading passengers into Vanderbilt Hall were restored by Altus Metal, Marble, and Wood. The restoration process of the inscription, which reads “TO ALL THOSE WHO WITH HEAD, HEART AND HAND TOILED IN THE CONSTRUCTION OF THIS MONUMENT TO THE PUBLIC SERVICE, THIS IS INSCRIBED” was complex. Altus’ expert crew of metal craftspeople used meticulous care to avoid damaging both the wall and the pins attached to the embedded letters. The bronze letters were removed individually, catalogued, labeled, and placed in order on special sheeting to avoid any misplacement. They were then stripped, re-oxidized to the accepted sample color, and coated with multiple coats of clear protective lacquer before being reattached to the original location. Altus’ team of marble restoration specialists lightly sanded the marble walls in a process known as diamond grinding, then poulticed the area to remove stains, honed, and polished it. The terrazzo floors were mechanically polished. Our team at Altus, is proud to have played a part in this remarkable effort to help preserve an iconic New York City landmark, started by Mrs. Onassis over four decades ago. To bring life to the words that pay tribute to the construction industry was especially gratifying as Altus celebrates our 25th year in business.